How can I have all fields show on a submission, even if they were left blank? In order to be HIPAA compliant, I am following the steps provided on previous threads. Specifically #2, which states to set up Email Notifications without any specific information. However, when we log onto our jotform account to see the submissions, we want to be able to see ALL questions on the form even if the client did not answer a question. This will allow us to have a better understanding of what information we may need to get from the client in person. Currently, when I view submissions thru the jotform page, only the questions answered by the client are displayed. Is there a way to have all questions displayed, even unanswered ones? And we are using the "Form Collapse" tool on some of our forms, when trying to get a pdf of these forms, the information located within that section is not visable. Ideally, we would also like to be able to print out a blank form for clients who may be here in person and need to fill it out. 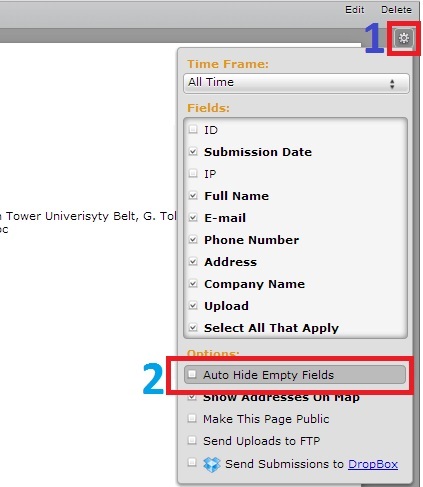 You can set the option to show empty fields on your submission page. Just click the small wrench icon on the upper right hand (right below the delete button) then uncheck the Auto Hide Empty Fields.